This event really is directed towards Srila Vyasadeva, thus in some sampradayas they refer to Guru Purnima as Vyasa Purnima. Traditionally it is the day when the guru is worshiped. In the book Festivals, Fairs and Fasts of India (Shakti M Gupta. 1991. Clarion books. page 88-89.) It says: Guru Purnima “……is observed on the full moon day in the month of Ashadha in honour of the sage Vyasa, by keeping a fast, worshiping him for His blessings and to gain wisdom. Formerly on this day, gurus who were the traditional teachers, were honored by their pupils. “When the second millenium (‘Dwarpa Yuga’) overlapped the third (‘Treta Yuga’), the great sage Srila Vyasadeva was born to Parasara Muni in the womb of Satyati, the daughter of Vasu (the fisherman).” (Srimad Bhagavatam 1:4:14.). The following is the story that we just touched upon mentioning how Srila Vyasa came to make His appearance. “He is known as Krsna, Krsna-dvaipayana, Dvaipayana, Satyavati-suta, Parasarya, Parasaratmaja, Badarayana, Vedavyasa, etc. He was the son of Mahamuni Parasara in the womb of Satyavati prior to her betrothal with Maharaja Santanu, the father of the great general Grandfather Bhismadeva. 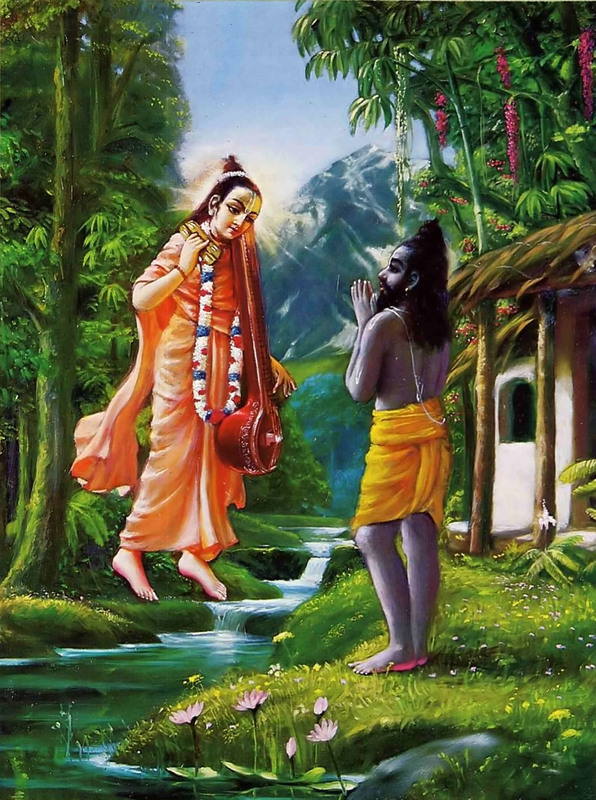 He is a powerful incarnation of Narayana, and he broadcasts the Vedic wisdom to the world. As such, Vyasadeva is offered respects before one chants the Vedic literature, especially the Puranas. 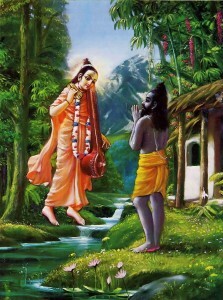 Sukadeva Gosvami was his son, and rsis like Vaisampayana were his disciples for different branches of the Vedas. He is the author of the great epic Mahabharata and the great transcendental literature Bhagavatam. The Brahma-sutras — the Vedanta-sutras, or Badarayana-sutras — were compiled by him. Amongst sages he is the most respected author by dint of severe penances. When he wanted to record the great epic Mahabharata for the welfare of all people in the age of Kali, he was feeling the necessity of a powerful writer who could take up his dictation. By the order of Brahmaji, Sri Ganesaji took up the charge of noting down the dictation on the condition that Vyasadeva would not stop dictation for a moment. The Mahabharata was thus compiled by the joint endeavor of Vyasa and Ganesa. 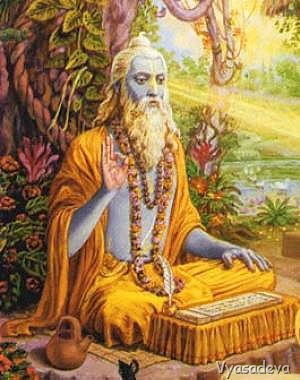 “The great sage, Srila Vyasa who was fully equipped with knowledge, could see through his transcendental vision the deterioration of everything material, due to the influence of the age. He could also see that the faithless people in general would be reduced in duration of life and would be impatient due to lack of goodness. Then he contemplated for the welfare of men in all statuses and orders of life. He saw that the sacrifices mentioned in the Vedas were means by which people’s occupations could be purified, and to simplify the process, he divided the one Veda into four, in order to expand them among men. The four divisions of the original sources of knowledge (the Vedas) were made separately, but historical facts and authentic stories mentioned in the Puranas are called the fifth Veda.”(Srimad Bhagavatam 1:4:17-20.). Traditionally in hindu culture there is puja and worship performed on this day because this day is also used to commemorate one’s own guru. However, Srila Prabhupada has given us a very practical way to worship the guru and Srila Vyasadeva as well. We can all take part in the chanting of Hare Krishna on beads and in groups and it doesn’t cost us anything, only a little time and having the will to do it. However, the benefits are unlimited! 2. Reading Srimad Bhagavatam and other literature presented by Srila Vyasadeva. Our ISKCON is the world’s leading publisher of books based on the ancient Vedas of India and these books are very accessible to everyone either in print or electronically. Therefore we should spend some time reading books like Srimad Bhagavatam and Bhagavad Gita and also apply that knowledge in our lives in a practical way.